[02:18:46] <jmkasunich> what is not working? [02:20:37] <SWPadnos> could you put that on pastebin or something, and make sure the line ends don't get mangled? [02:23:00] <tomp> haha i just made a video of this new control. the camera is focused on the screen, and you see my hands waving while i talk thru the demo. it looks like white fang & black tooth from soupy sales. [02:23:31] <jmkasunich> LabRat: what directory are you in when you run make? [02:24:34] <jmkasunich> what is modsilent? [02:25:13] <SWPadnos> you run a script called ./modsilent. what is it? [02:25:51] <jmkasunich> wtf is it? [02:26:46] <JymmmEMC> 120vac with a cap across the coil of a relay. If I remove power, will there be a delay in opening the coil? [02:31:02] <jmkasunich> LabRat: your system is using gcc 4.2.3? [02:34:11] <LabRat> is there a command to check compiler version? [02:34:25] <JymmmEMC> gcc -v ? [02:34:53] <JymmmEMC> "Pick B!!! Pick B!!!" [02:35:27] <jmkasunich> you compiled your own rtai? [02:36:20] <SWPadnos> what network driver do you have? [02:36:36] <jmkasunich> so, did EMC compile correctly before you replaced our RT kernel with your own? [02:40:19] <jmkasunich> SWPadnos: are you looking at the same pastebin I am? [02:42:18] <jmkasunich> where is features.h mentioned? [02:43:46] <jmkasunich> you said "asm/types.h" doesn't include anything, that was a typo? [02:44:01] <jmkasunich> you meant "asm/posix_types.h doesn't include anything"
[02:57:09] <SWPadnos> in what directory is the ipipe-enabled kernel? [03:02:13] <SWPadnos> ok, and that's the RTAI-patched kernel? [03:03:02] <LabRat> is source location something I can supply to the ./configure script? [03:04:50] <SWPadnos> what's the origin of the linux-headers-2.6.24-realtime dir? [03:05:00] <SWPadnos> was that from a package supplied by us? [03:08:51] <SWPadnos> I guess I don't understand what you mean by "compiled the header filess"
[08:08:03] <archivist_ub> I dont agree "<cradek> (there's virtually no use for a horizontal rotary on a cnc)"
[09:01:29] <anonimasu> archivist_ub: how good precision do you get with it? [09:02:33] <anonimasu> I saw a figure quoting 10arcseconds for a vertex table..
[09:02:36] <anonimasu> which sounded pretty good..
[09:09:01] <anonimasu> hm, I'd probably stick a encoder on the table.. toget absolute angle..
[09:12:20] <anonimasu> dont you compensate for that when you set up a chuck? [09:13:55] <anonimasu> uh, but you only need to set a chuck up once..
[09:18:00] <anonimasu> just buy a much better table. [09:25:27] <Paragon> So could it be done do you think? [09:27:18] <Paragon> The great thing about them is there is zero backlash and no loss (heat) due to coupling losses etc..
[09:27:40] <archivist_ub> hmm "limited angle"
[09:35:49] <Paragon> I saw them yesterday. I do like them but it's just collecting them thats the problem. Not to mention space being a premium. However I am thinking practice a little more with Starmill and then move to an Orac as it's probably the natual progression. [09:37:33] <Paragon> archivist_ub: What kit do you have in the workshop? [09:40:24] <Paragon> The shop your working at is closing? [09:41:09] <Paragon> lol .... got anything lined up yet? [09:41:55] <Paragon> OK ... What machines are you scavenging? [09:42:56] <archivist_ub> there is more than I can take home! [09:43:29] <Paragon> Are they having a sale? [09:43:53] <Paragon> Where are you based? [09:46:47] <Paragon> LOL ..... I thinking of getting into miniture gas turbine engines. [09:47:39] <Paragon> Do you think there is a market for them? [09:49:49] <Paragon> I have been testing a homemade arc furnace for melting inconnell 618 for casting. [09:51:28] <Paragon> I bought two arc welders and connected themin paralell the cables connect to grphite rods that burn at 3000C! [09:52:34] <Paragon> I built a vacuum chamber from down pipe to be used in vacuum lost wax casting. 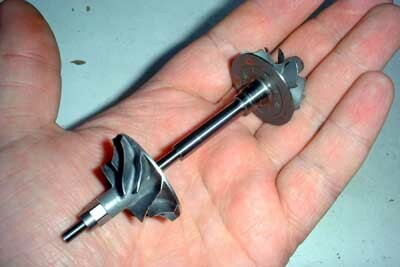 [09:55:26] <Paragon> I have a small compressor wheel 30mm dia. Most gas turbines use a 66mm. but I am aiming to make them smaller. The other type of efficient compressor is the closed swept back blade type. this could be cut on a fourth axis with out to much trouble I would think. [09:56:40] <Paragon> archivist_ub: Like your website. [09:57:51] <Paragon> Sure, but at least its a start. [09:59:32] <Paragon> What are the gears called that have spikey teeth? [10:01:47] <Paragon> anonimasu: The arc furnace? [10:02:08] <anonimasu> they sell for alot of cash..
[10:05:45] <anonimasu> not big gear machines? [10:10:23] <Paragon> Oh before I go I would just like to ask ... Converting a rotary table to CNC. What issues are there on mounting the optical encoder on the table axis rather then using the optical encoder on the motor shaft? [10:16:24] <anonimasu> in large steps to compensate until the table moves. [10:17:10] <anonimasu> hysteresis between encoder counts..
[10:20:13] <Paragon> That makes sense. Thanks for the info. CU soon. [10:32:35] <Paragon> Just got back for moment... What about using a big motor connected directly to the rotary tables axis avoiding the the use of the worm gear? [10:35:41] <Paragon> Does a planetary gearbox have a lot of backlash? [10:36:44] <Paragon> archivist_ub: Does the table in the link above appear to be direct drive to you? [10:39:39] <anonimasu> uh.. will a sieg x3 machine inconel? [10:39:40] <Paragon> Appears the table is using a servo, what is the difference between a torque motor and the motor in use in the video ... without stating the obvious? [10:39:57] <anonimasu> torque motors are low speed motors with alot of torque. [10:40:12] <anonimasu> while servos are higher speed and generally needs a reduction to reach very high torques. [10:40:31] <Paragon> Can they be driven in the same way as a servo with optical encoder etc? [10:41:10] <anonimasu> and I very much doubt the sieg x3 will cut inconel. [10:41:48] <Paragon> Thats a good point (inconnel) is it tough to cut then? [10:42:11] <anonimasu> you talking about cutting it and have no clue? [10:48:20] <anonimasu> well, heat cycling carbide is not a good thing either. [10:57:40] <anonimasu> Paragon: is there sound in that video? [10:58:47] <Paragon> Sorry... Yes there was.... it didn't sound pleasant! [10:59:16] <anonimasu> sounds like you need a rigig machine huh? [10:59:42] <anonimasu> I'd make wax molds..
[10:59:53] <anonimasu> I pasted a link yesteday about how they make turbine blades..
[11:00:11] <Paragon> Use lost wax casting. [11:00:43] <anonimasu> then they coated them in glass for machining so the blades wouldnt get damaged..
[11:01:45] <Paragon> For the disk type ie all in one turbine could the be pressed into shape? [11:02:12] <anonimasu> no, for blades..
[11:02:19] <anonimasu> for a wheel they probably cast them..
[11:02:27] <anonimasu> with some special process then balance..
[11:03:09] <Paragon> grind the slots then press the disk into mold press to form the blade curves. Would this work? [11:05:13] <anonimasu> if you can buy them premade buy them. [11:06:07] <Paragon> I could possibly cnc the blade profile into two steel block then heat the inconnel disk and press it between the blocks. [11:06:34] <anonimasu> this is for single blades..
[11:07:02] <anonimasu> I mean look for a turbocharger with complete wheels that fit..
[11:07:09] <anonimasu> mhi td03 or something smaller..
[11:07:14] <anonimasu> and just buy wheels..
[11:09:23] <Paragon> The profile beleive it or not is not that critical. Some people still use stainless steel cut slots and then twist the blades into possition. [11:09:47] <Paragon> mhi td03 mitsubishi ? [11:09:53] <anonimasu> uh.. for effiency it's pretty important isnt it..
[11:10:22] <anonimasu> there are a smaller size..
[11:11:27] <Paragon> This is the guy I got the compressor wheel from (Thomas) he had a spare of the one you see in the picture. [11:12:39] <anonimasu> how hot does your furnace get? [11:12:47] <Paragon> Thats for sure. [11:13:14] <anonimasu> that you can melt inconel? [11:15:22] <Paragon> One problem is feeding the anode and cathode at the most efficient speed. At the moment I have only done it by hand. I hope to feed it with a stepper based on amps drawn. [11:25:57] <archivist_ub> funny ".I have melted tools in inconel but have never melted inconel"
[11:40:15] <Paragon> ...Are these kits measured by the t nuts or table slots? [11:51:19] <fragalot> boo... I got a parallel cable,.. but it appears to be a null modem cable... I don't think this 'l work? [12:48:04] <jepler> skunkworks_: did you say the other day you are working on milling your circuit board? [12:50:48] <archivist_ub> skunkworks, whats that pic supposed to be ? [12:52:31] <skunkworks_> hope to make it back this weekend. [12:53:23] <skunkworks_> A few false starts.. I had a plastic bag over the open vaccum holes.. The bit grabbed it and pulled it right off the table. [12:59:43] <skunkworks_> SWPadnos: what fun is that? [12:59:58] <skunkworks_> when and if this works - I am seriously thinking about having them made. [13:00:02] <SWPadnos> uh - the fun of actually having the boards soon, with plated-through holes?? [13:01:24] <SWPadnos> does eagle have EDIF export? [13:57:34] <Paragon> Just been contacted with regards to the DRT-100 direct drive rotary table. They want to know my life story before they will quote me the price.!!!!! [14:04:19] <Paragon> Please could you provide me with some information on your application from which we could confirm the suitability of this device. Please also let me have a telephone number and I’ll call you to discuss. Finally, please let me have your company details so as I can prepare a quotation. [14:50:03] <anonimasu> when threadmilling what kind of Z stepdown do I need per rev? [14:50:05] <anonimasu> same as pitch? [14:50:49] <cradek> sure, how else could it work? [14:51:13] <anonimasu> and they step Z down 4.5 per rev..
[14:51:33] <anonimasu> seems very much so. [14:52:39] <anonimasu> ah well, im just playing if it fails it fails. [14:54:42] <SWPadnos> how tall is the threadmill end? [15:26:46] <tomp> the thread faces get concave by moving a straight line ( face edge of tool) ? [15:27:46] <archivist_ub> and I went ah! [15:28:40] <fenn> BigJohnT: are the flanks straight or curved slightly? [15:29:48] <tomp> can you rub a stone on it or dykem up a screw or something to look for high spots? [15:30:03] <cradek> what size of thread mill? [15:30:50] <cradek> what's the diameter of the thread mill? [15:32:27] <BigJohnT> it is 3 flute so kinda hard to measure but it is about 0.175"
[15:34:07] <tomp> archivist_ub: that tool gave you a concave surface when it swung about its own axis , and boved along its centerline? [15:36:18] <cradek> might be very hard to do/see though. [15:36:42] <SWPadnos> wouldn't you want to check a threadmill against a die? [15:42:23] <tomp> archivist_ub: i didnt look at your program, but tilting to the helix angle suggests the A rotates the work, the tool is offcenter, rotating, moving in Z interpolated with A. no circular interpolation? [15:42:30] <BigJohnT> "One thread mill produces a variety of thread diameters for the same pitch without degrading tool performance and can be used for through and blind holes." [15:43:16] <BigJohnT> THE SAME PITCH (T.P.I.)? [15:43:20] <BigJohnT> THE LENGTH OF CUT IS THERE THAT IS NEEDED." [15:48:08] <fenn> is there a difference between threadmilling and internal thread whirling? [17:04:36] <anonimasu> worked great.. in 4 lines of gcode..
[17:06:40] <anonimasu> I dont want a gang tool lathe..
[17:07:48] <tomp> Paragon: where's the encoder coupled? to worm or axis? [17:08:15] <anonimasu> ones with collet chuck..
[17:08:33] <anonimasu> well, the ones where the workpiece moves..
[17:09:12] <Paragon> tomp: I was enquiring if there was any benifit in coupling to axis over the worm so as to keep down back lash. [17:10:44] <tomp> i use 'System 3R' c-axis. looks same. meant for edm, mounts on end of Z. encoder is on worm. it fails to see the lash between worm and ring. guaranteed to .001degree. [17:12:32] <Paragon> I may have one of those lying around. God knows where though. [17:13:16] <Paragon> Back in mo ... Dinner is calling! [17:15:19] <tomp> anonimasu: from solid? milling? [17:17:45] <anonimasu> heh, on a tiny mill. [17:18:41] <SkinnYPup> How much longer is 6.06 supported for ? [17:25:01] <tomp> anonimasu: thx, i'm still waiting for 1st pdf. [17:26:32] <tomp> SkinnYPup: wikipedia sez "Ubuntu 6.06's support will end in June 2009 for desktops and June 2011 for servers. " [17:47:46] <fragalot> any ideas what it might be? [17:48:07] <skunkworks_> probably something is wrong. [17:49:53] <fragalot> archivist_ub: this is at 2Hz..
[17:52:43] <archivist_ub> for what degree of "should"
[17:56:02] <fragalot> I checked all combinations i could possibly check,. I just swapped the motors and this one runs fine. [18:05:00] <anonimasu> fragalot: .4Nm is always .4Nm..
[18:19:35] <anonimasu> I think they are super long endmils..
[18:20:11] <fragalot> hows the weather? [18:25:19] <fenn> anonimasu: how do you manage to get huge slabs of steel when shipping is so expensive? [18:31:11] <Paragon> ...poor quality pictue. Has anyone got any ideas? [18:33:06] <Paragon> cradek: That URL I gave wont load? [18:33:43] <Paragon> OH ok let me check again. I cant test the connection from the outside word. [18:42:58] <fragalot> SWPadnos: they aren't unroutable. [18:49:55] <toastatwork> and they have a problem with their "compiler"
[19:15:27] <tomp> does firefox 3 hang for others(ubu 8.04 rt)? it seems i xkill it a lot, maybe always. [19:26:32] <Paragon> LVDT transducer ? [19:27:26] <Paragon> google is my freind! [19:28:58] <Paragon> I guess the object need to be metal right? [19:31:37] <Paragon> I can just make out Main body = ADE 2001 and probe end = ADE2102? [19:33:54] <Paragon> Next question can this be used with EMC? [19:34:27] <Paragon> archivist_ub: I leave it open so I can connect from work. [19:40:40] <archivist_ub> maybe but likely no as its a linear device with one "cycle"
[19:41:55] <Paragon> archivist_ub: Found the setting port 80 and 8080 is open as a virtual host could you try again please? [20:14:49] <Paragon> I do prefer Apache as I understand it better. [20:25:26] <DaViruz> what quick change tooling system is that? [20:25:55] <Paragon> I think it's called Easy Change (EC). [20:27:15] <Paragon> DaViruz: Are you talking about the mill or the lathe? [20:30:35] <Paragon> The EC quick change system is used by twisting the bottom of the holder and inserting the tool holder 3 large ball bearings in the spindle (R8-EC) then lock onto the tool holder. [20:32:00] <Paragon> BTW did the vid's come out OK? [20:36:06] <MASEngr> Good afternoon, folks. I've got a quick question. [20:36:24] <MASEngr> Is there a cycle timer for a job, so we know how long it took to mill a part? [20:37:37] <skunkworks_> could you use the m1XX codes to run a stopwatch program? [20:38:08] <Paragon> cradek: how does one eliminate following errors on a stepper system? Change the base thread or something? [20:38:50] <cradek> Paragon: there are various ways a stepper system can be misconfigured and get following errors. [20:39:45] <Paragon> cradek: No probs. I think Iv'e been through this before sometime ago. I'll go back to the manual. [20:40:09] <MASEngr> Paragon, I retuned the PID loops and eliminated following errors here. I was also able to get a faster speed as a result. [20:40:26] <MASEngr> The loops were *terrible*. [20:40:37] <MASEngr> Ah, whoops, I misread that as servo. [20:41:47] <Paragon> I think I need to do some more latency test as archivist_ub sugested. Thanks anyway. [20:42:00] <MASEngr> Thanks for the answer about the timer, cradek. I'll see if I can hook something up. [20:44:34] <Paragon> How does one continue a nc program after stopping it at some point. I did right click and select 'start from here' The program started from there alright but did not start the spinlde as the m03 was at the top of the program? [20:47:46] <jepler> cradek: is SPINDLE_MODE in 2.2.6? [20:50:06] <Paragon> cradek: Can the pluto-p board be used in conjuction with a second para port? I was thinking of running the stepper drives from pluto and a servo from a second para port. While I am at it can the spare pins of the port that pluto is using be used? [20:51:59] <Paragon> jepler: I can install the dev head. [20:52:00] <jepler> you should be able to use one parport with hal_parport and one parport with pluto_step or pluto_servo. [20:53:22] <alex_joni> if I understand your last question right..
[20:54:22] <alex_joni> but there are probably some leftover pins on the pluto itself..
[20:54:48] <Paragon> The pluto is only setup for 3 - axis right? [20:56:53] <jepler> pluto_step has 4 step generators. pluto_servo has 4 PWM generators and 4 encoder counters. So on either one you could run 4 axes. On pluto_servo you can run 3 axes plus spindle motor. [20:58:52] <Paragon> I see. So could I run 3 step and 1 pwm + encoder? or is it all stepper or all pwm? [21:00:12] <jepler> it's all stepper ('loadrt pluto_step') or all servo ('loadrt pluto_servo'). [21:00:30] <Paragon> Ok thanks Jepler. [21:02:16] <Paragon> Just took a look at the Mesa 7i43 so is this recommended for EMC? I could not find the cost. [21:04:27] <anonimasu> pretty cheap huh? [21:18:58] <Paragon> Does it work out the box with EMC? [21:20:09] <Paragon> Is it still in the dev stage? [21:20:38] <Paragon> Thanks for the info. SWPadnos . [21:24:20] <Paragon> I will do. It's a nice little card. Although I really cannot get my head around the language it coded in. [21:27:08] <fenn> SWPadnos: any suggestions for how to start learning VDHL or verilog? [21:32:13] <Paragon> at the same time. [21:32:15] <Jymm> then who will win the race? [21:33:10] <Jymm> 10 LPRINT CHR$(12) 20 GOTO 10 "We dont need no stickin functions!" [21:33:55] <SWPadnos> party on, dude! [21:35:20] <Jymm> Afreinds 6yo used to call him "dude" all the time, so he would tell him: "I'm not your dude, dude, I'm your dad dude!" [21:35:43] <Paragon> they have multiple processors (cogs) right? [21:36:06] <Paragon> That run in parallel. [21:37:20] <Paragon> So the train of thought is similiar. [21:37:59] <Paragon> where as fpga is pure logic gates? [21:48:48] <Paragon> NO first one was the A1000 with 256k of memory. It had a base unit. I then bought the A500. [21:50:09] <SWPadnos> our high school computer club designed and built a memory expansion for the VIC-20 - a whopping 16 or 32k! [21:50:22] <Paragon> Your correct Agnes. Got it was a while ago. [21:51:59] <Paragon> I first started on an old Commodore PET which had a membrane keyboard. [21:52:03] <SWPadnos> say "this is unintelligible"
[21:53:39] <SWPadnos> hmmm. looks a bit like the Atari game "Tail of Beta Lyrae"
[21:53:49] <Paragon> lol .... The games where fun to play then. Is it that I am getting older or was the game play that much better than todays graphic intensive games? [21:54:48] <Paragon> Attack of the muttant cammels (Jeff minter), Elite (ported from BBC Micro) Arrr Nastalgia. [22:01:06] <archivist_ub> tested it a year ago and its slightly deaded 0k ram! [22:11:44] <skunkworks> Paragon: seb just joined..
[22:13:25] <Paragon> Seb it's been mentioned that you are working on 7i43 board code for EMC. At what state is it at? [22:14:27] <seb_kuzminsky> what are you trying to do with it? [22:17:00] <Paragon> Can they be mixed? Ie 3 steppers xyz and a servo / encoder for A axis? [22:17:50] <Paragon> Seb do you know how much the delivery charges are to the UK? [22:18:35] <Paragon> Sure thing Seb. [22:20:36] <Paragon> BTW will I see a massive inprovement with regards to motion speed. I think the limiting factor for me at the mo is EMC driving the pulses via the para port. The stepper drivers I have go to something like 52000 micro steps from memory. [22:23:05] <Paragon> OH one last thing what board shoud I go for I understand there are three version right? [22:23:23] <Paragon> Para only or usb / para ? [22:25:48] <Paragon> When you say larger are they all compatible or do they need to from the 7i range? [23:24:55] <LawrenceG> somewhere I saw a program to make gcode for cutting xl timing pulleys.... anybody have a link? [23:40:07] <LabRat> Can anyone help? [23:45:48] <jepler> can you run the rtai testsuite, such as kern/latency? [23:47:22] <jepler> what rtai version? [23:50:52] <archivist> LawrenceG, are you using a rotary axis? [23:54:40] <jepler> LabRat: on your system, loading the kernel module rtai_malloc is required but emc doesn't know about rtai_malloc.